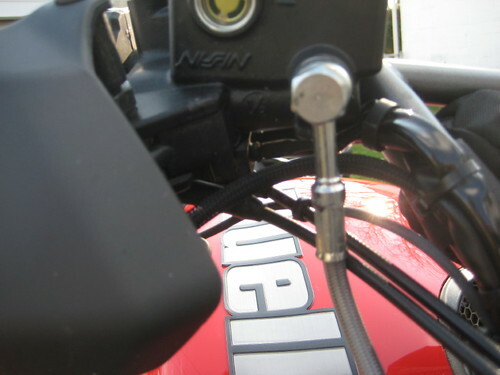 In all my previous motorcycles, I've added electrical accessories over time. This usually led to in-line fuses being hidden all over. 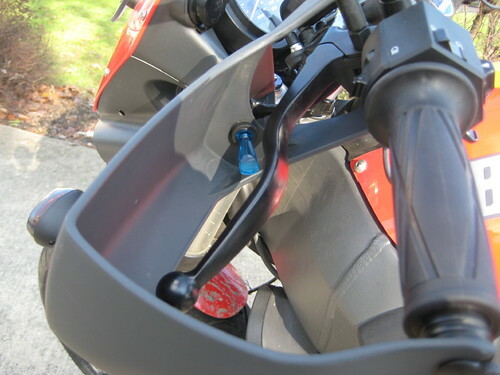 For this motorcycle, since I purchased it new, I wanted to create a single organized solution. 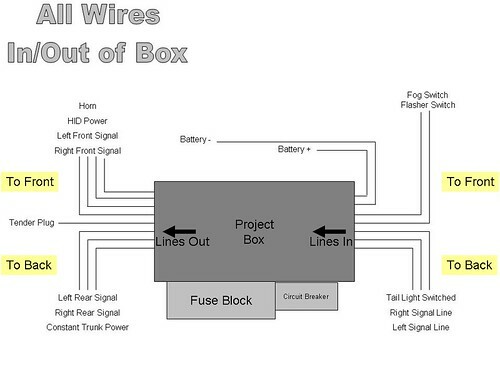 I used a project box, added two relays in each side, plugged into dual relay sockets. 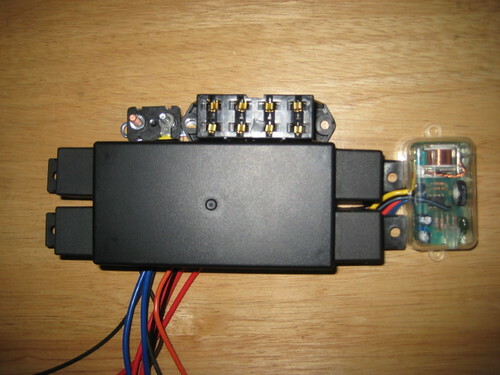 Then an additional 528T pulse timer relay was added for my HID low beam headlight. 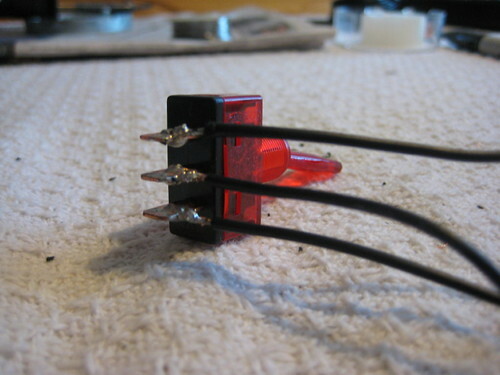 On the front of the box is a 4 bank fuse block, as well as a single circuit breaker. 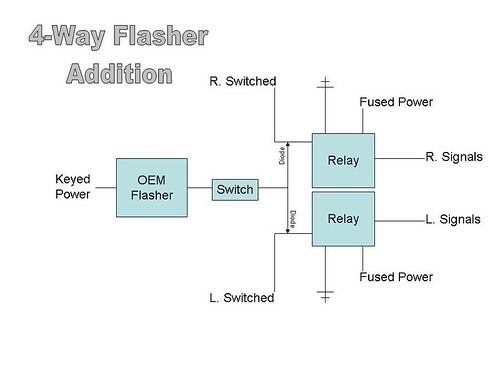 Two relays are used to switch the turn signals from 'constant off, and blink on for signal' to 'constant on, and switch off for signal'. 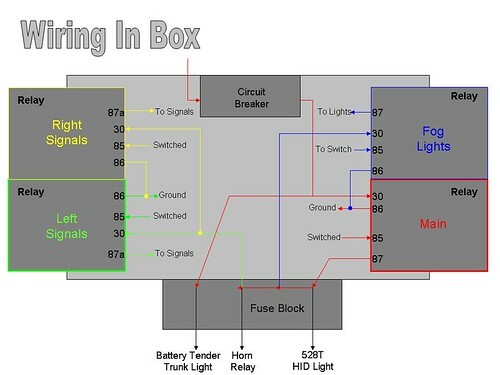 This gives me front and rear marker lights. 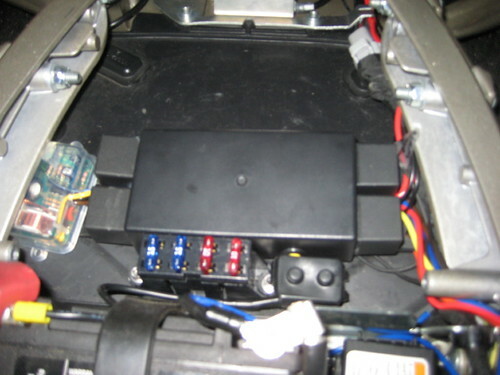 On the other side is one main power relay (giving me a source for 'switched with the key' power) as well as a relay for my fog lights. 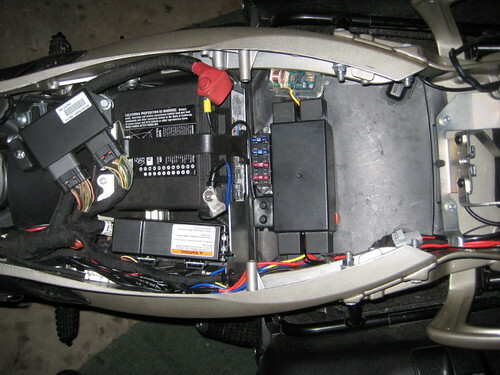 The clear timer relay is wired to my HID low beam. 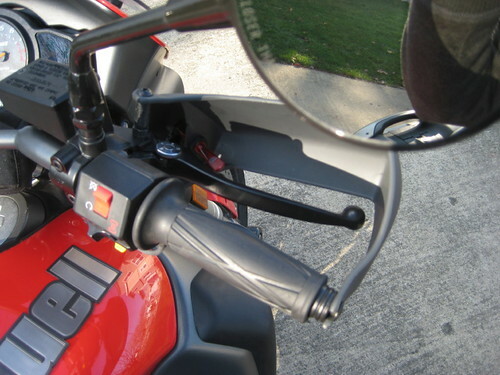 This gives me a 30 second delay before the light powers up, giving more power for starting the motorcycle, and causing less issues with the light flashing with the starter. 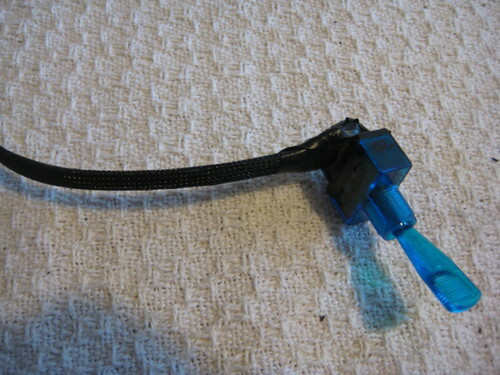 The fuse block has one constant fuse, for my battery tender and internal trunk light, another fuse is for the horn as well as turn signal/marker lights, the third fuse is for my fog lights, and the forth fuse is for the HID low beam headlight. 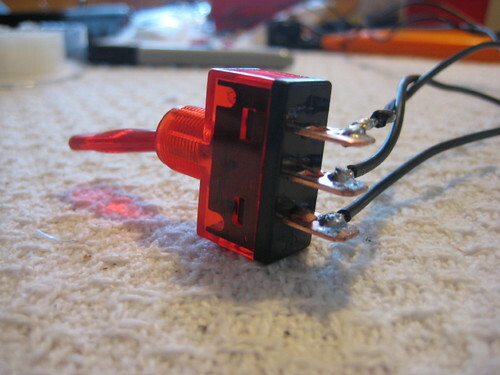 The circuit breaker is powering the main relay. 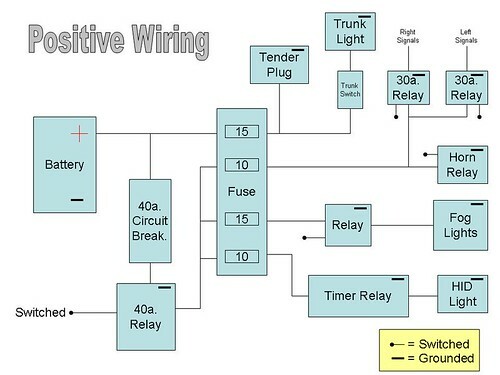 These are some basic wiring diagrams. 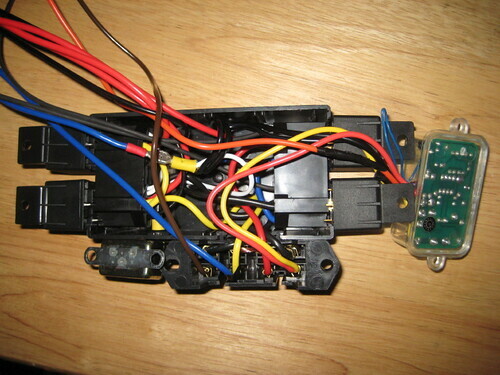 I added a couple diodes in line to a switch, resulting in 4-way flashers. 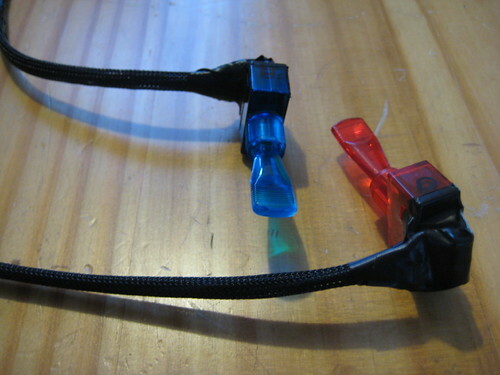 I added some illuminated paddle switches to control my fog lights (blue) and 4-way flashers (red).